Al Ahmadi Cultural Center will be a hub for hosting art, music, theatre, and dance performances. Image: ©SOM. Designed by Skidmore, Owings & Merrill LLP, the building has received multiple awards owing to its innovative design. Image: ©SOM. The courtyard will provide access to the various programmes featured within the complex. Image: ©SOM. The cultural centre will include theatres, concert halls, galleries and conference centres. Image: ©SOM. The filtered roof of the galleries allows only soft natural light for displaying artefacts. Image: ©SOM. The cultural icon will be located south of Kuwait city in Mahboula and is scheduled to open in 2017. Image: ©SOM. 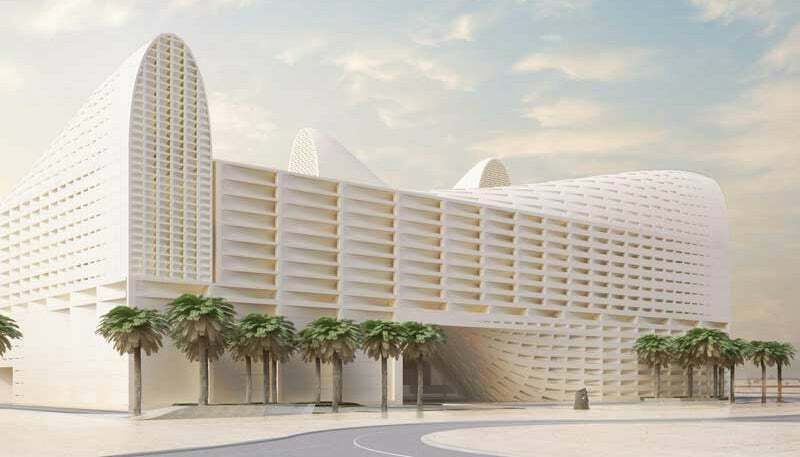 Al Ahmadi Cultural Center is a proposed community cultural centre to be located in Mahboula, south of Kuwait city. Designed by Skidmore, Owings & Merrill LLP (SOM), the centre will promote art, music, theatre and dance in the city. The building will feature multiple theatres and performance spaces, as well as galleries for fine arts and historic cultural artefacts. The project is part of the National Council for Culture, Arts and Letters’ (NCCAL) plan to set up more museums and cultural venues in the country, and will be joined by two more centres in the future. At the Architizer awards in 2016, the project received a special mention in the unbuilt cultural project category. It was also awarded concept design of the year at the 2015 Middle East Architect awards, which were held in Dubai, UAE. The project also won an American Institute of Architects’ (AIA) Middle East award in the unbuilt design category. Blending modern architecture with Kuwait’s rich cultural heritage, the Al Ahmadi Cultural Center’s design adapts to its purpose, climate conditions and location. The building has been designed to host programmes, ranging from theatre and arts to dance performances, and be easy for visitors to navigate. The courtyard will be the access point to the building, linking performance spaces situated at its four corners and the galleries along the eastern and western edges. Its traditional Islamic architecture adapts well to the country’s climate, and the centre’s programmes are designed around the courtyard, making it an orientation device for the structure. Meanwhile, the building’s design references the country’s time as a seaport and maritime power. Its roof resembles a dhow sea vessel with two large masts and lateen sails. The centre is designed to conform to harsh climate conditions, while continuing to function smoothly as a public space. The building’s interiors and exteriors are designed for high levels of solar radiation and temperatures. Sunlight is filtered to provide optimal lighting for displaying art and historical artefacts. "Light-filtering modules above the courtyard are designed to provide sunlight to performance spaces throughout the day." Light-filtering modules above the courtyard are designed to provide sunlight to performance spaces throughout the day. Thermal mass is also provided by the filters, which are used to decrease cooling loads. Spread across an area of 43,010m², the centre will comprise two 800-seat theatres, a 400-seat concert hall, a cinema, conference and children centres, and galleries. The building will have four storeys with entrance and access to different spaces available from the central courtyard. The total site area of the building is 25,500m².